Where to Find Online Full Ring Poker in the U.S.
Full-ring poker was once the most common form of No Limit Texas Hold'em, but it has been largely supplanted in many places by 6-max games. Nevertheless, there are still quite a few cardrooms online that feature full-ring cash games, and some of them accept American players. 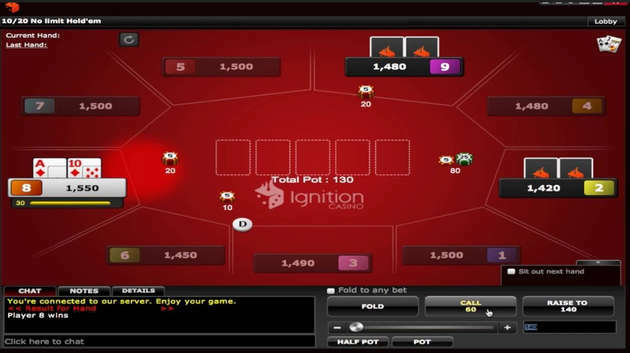 Ignition Poker is the leading U.S.-facing site for poker ring game tables with nine seats. The Chico Network comes in second place in our opinion while Americas Cardroom is the third-best option. Full-ring poker isn't unquestionably better than short-handed play, but it does offer a number of advantages. For one thing, it's closer to the live experience, so anyone transitioning from brick-and-mortar venues to the online space would probably feel more at ease at 9-max tables. It's possible to play ABC poker, perhaps with the aid of a poker hands chart, without giving away too much of an edge to your adversaries. In six-person tables, this is less often the case because there are fewer multiway pots, and so your strategies have to be more tailored to the specific individuals involved in the hands you play. Another benefit to tables with nine seats is that variance tends to be smaller than in six-max. Proper guidelines for poker bankroll management in cash games suggest that you can safely play higher stakes in full-ring than shorthanded with the same BR. When you opt play poker online for money, it's important to find companies you can trust. Each of the firms on our list of top full-ring poker sites for U.S. residents has a long history of truly random card dealing and fair games. They're renowned for the speediness of their payout procedures especially since they all allow you to transact in the digital currency Bitcoin. Each of these rooms has enough FR cash tables to permit you to choose from among many active games. It's now hard to tell how many nine-player NLHE tables are active at Ignition due to the recent changes to the lobby system, but full-ring regulars seem to think that it has decreased a bit. Nevertheless, there are plenty of games going from the $5NL to the $200NL level. At $400, $600, $1,000 and $2,000 max-buyin tables, you might not be able to find a game with people in it. At this site, all players remain anonymous and are only identified by player number. Thus, getting reads on people and writing notes become less important, and employing solid fundamentals takes precedence. Tight, conservative hand selection is what's needed to win here especially from early position. The user base of Ignition and the other PaiWangLuo Network skins is comprised of a lot of sports-bettors and casino gamers who aren't very skilled at Hold'em, so you should still be able to beat the games even without knowing anything about how each individual plays. When you create an account at Ignition, you'll receive a 100% match on your deposit, up to a maximum value of $1,000. The whole $1,000 bonus averages less than 30% of your rake back on cash game tables, but the initial portions of it are tailored to give you an appreciably better rate of return. If you play for micro stakes and don't wish to deposit an entire grand, then this is the perfect bonus for you. 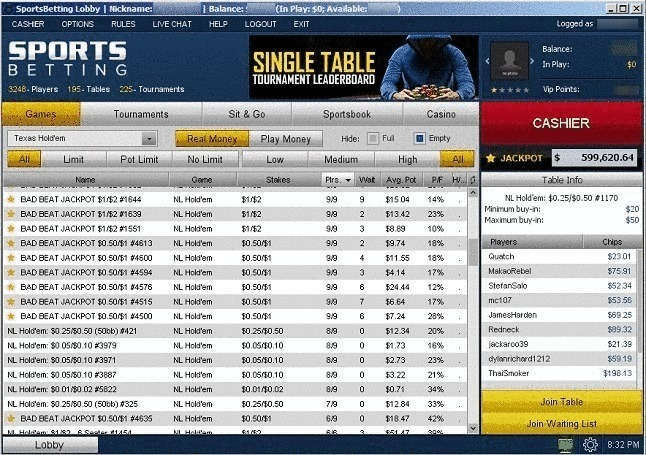 Chico Poker Network, which hosts both BetOnline and Sportsbetting.ag, has games that are almost as soft as at Ignition, but it uses a traditional lobby-and-waitlist system rather than the new innovations that have come to fruition at its competitor. FR poker games are listed from $0.01/$0.02 to $5/$10 though the majority of the action happens at $1/$2 and below. For whatever reason, there's a more even division between 6-handed and 9-max games at Chico than at any other online card site available in the United States. Most of the time, full ring accounts for one-third or more of the running No Limit Hold'em tables. Check out our reviews of BetOnline and Sportsbetting.ag to learn how to receive a 100% up to $2,500 welcome bonus. While clearing the bonus, you'll be receiving 33% of the amount you rake added to your balance in increments of $5. Cash game players are eligible for leaderboards that pay out $10,000 per week but only at stakes of $0.10/$0.25 and higher. Americas Cardroom certainly has a lot of cards flying through the virtual air at a large number of No Limit Texas Hold'em tables. There's just one problem: The overwhelming bulk of the games are six-player competitions, which outnumber their full-ring counterparts by a 4:1 margin or even more. Another drawback is that the individuals who take their seats at ACR tend to be more seasoned than the fish you'll find at some other sites. The blind levels reach as high as $25/$50 here, but you'll seldom see a nine-person table with actual play happening above $2/$4 or $3/$6. On a more positive note, every cash game player is eligible for the weekly The Beast leaderboard, which typically pays out money and tournament entries to more than 200 places. You can enhance your profitability at Americas Cardroom with a 100% up to $1,000 first deposit bonus, $50 free to use on Jackpot Poker sit-and-goes and your choice of either a 27% rakeback program or the Elite Benefits rewards scheme. The bonus is released at a 20% rate of return. ACR also has several sister sites on the Winning Poker Network that you may wish to take a look at: BlackChip, True, and PokerHost. 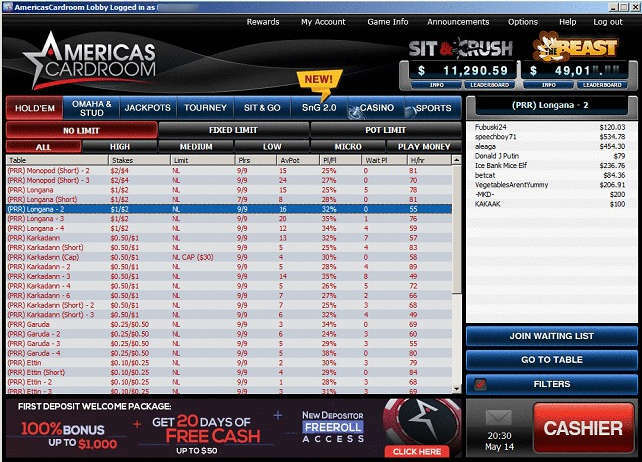 Ya Poker is another one that serves non-U.S. players, mostly in Latin America.